Given that I’m a trainer and coach, people ask me all the time if I’m always being asked for pointers while I’m working out at the gym. No, I don’t. Probably because I have a world-class gym RBF, which makes it pretty clear to everyone that I’m there to work out and I mean business. Most people wisely just steer clear. Now it’s not that I’m trying to be unfriendly — I’m just there to really focus on me. I’m not assessing or judging anyone’s form in my head or criticizing others’ choice of exercises. It’s my time and, generally, I respect that everyone’s on their own journey. But if I could provide one piece of advice to people based on the little I do observe in my fellow gym-goers, it would be this — please stop wearing running shoes when you hit the weights to squat, deadlift, and lunge. Look, running shoes are fabulous. I own several pairs of them. And do you know what I do with them? I run in them. That’s about it. You wanna know why? Because running shoes are … (wait for it) … for running. And yet, somehow running shoes have become an all-purpose shoe for people in the gym — and I don’t mean just for the treadmills. I find this a bit baffling. First of all, running shoes ain’t cheap — and for good reason! They’re packed with features that make running way more comfortable and efficient. Second, they’re just not good for non-running things — like squats, deadlifts, and lunges. Let’s talk about why. Cushioning. Part of what makes running shoes so great for running is that they are springy and cushiony — like pillowy marshmallows except, you know, with arch support. The point of this is to absorb shock. Also, running shoes are designed to be a little squishy and give a bit to accommodate changes in terrain and things such as rocks, sticks, or uneven sidewalks. Shape. The design and shape of running shoes is to keep your foot in motion. Running shoes have a curved bottom and a raised toe that helps rock your foot forward so you can push off during your gait cycle. This is all great for running — and pretty much the opposite of what you want when you’re weightlifting. You need firm support from your foundation as well as the ability for your whole foot to press into and engage against the floor. Running shoes are simply not designed to provide the necessary level of stability you need to lift well. When someone squats, deadlifts, or lunges wearing a running shoe, watch what happens — their feet move around a lot inside the shoe, and even the shoe itself moves. You’ll see side-to-side movement as well as some rocking action from front to back. All of this squishiness and movement is great when you’re running, but terrible when you’re loaded up with weight. If your body has to work to find and maintain stability on an unstable foundation, you lose power and make your lifts weaker. And it’s also really dangerous. If you’re someone who feels discomfort in your knees during or after squatting and lunging, listen up. Squatting and lunging in unstable shoes can cause your knees to cave inward, placing them in a position of significantly increased pressure which equates to significantly greater injury potential. Plus, it’s just bad form, people. When squatting, deadlifting, and doing lunges, you want shoes that have a hard sole, a flat bottom, and good support on the sides. The more stable the shoe, the more you can channel the energy of your muscles into lifting strong and powerfully rather than trying to stabilize an unstable surface to protect your joints. To be clear, I’m not saying that you’re required to go out and buy fancy or expensive specialized shoes for lifting (although if you plan to take lifting seriously, that’s definitely something you should explore with your trainer or coach). 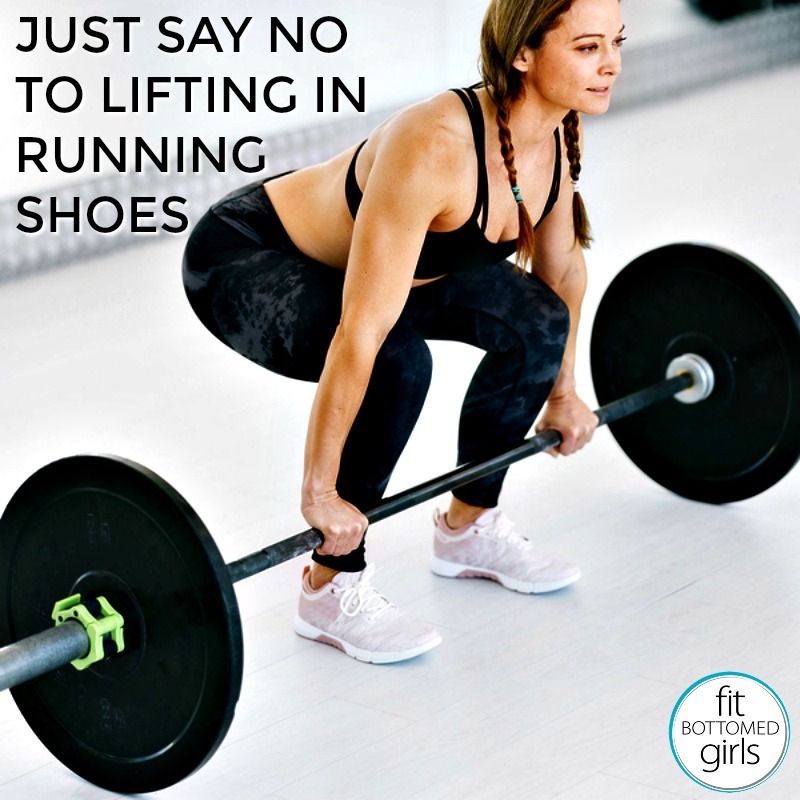 All I’m saying is please stop wearing running shoes when you grab the weights and bang out your lower body strength work. Seriously, a good, stable, flat-bottomed pair of cross-training shoes is a worthwhile investment that could (1) save you from an injury and (2) might even help you see that you’re stronger than you think when you’ve got the right foundation. Oh yeah, and both those things will help you be a better runner for those times when you do lace up those running shoes. What type of shoe would you recommend for a cardio class – like a step aerobics class? A running shoe or more of a cross training shoe? Great point! Do you have a go to shoe that you like the most for weightlifting? Thanks For Sharing This Fitness Post. I definitely found this interesting to read because I almost always use my running shoes when I work out. What else should I consider when working out? I started taking TestWORx to enhance my workouts, but what do you think of using supplements to work out? very useful information because almost everyone wear running shoes while workout. Thanks for sharing. Thanks for sharing this informative article with us. Great post and loved your work.